Tottenham Hotspur visit Old Trafford to play Manchester United on Monday night. A crisis-hit Manchester United side host Tottenham Hotspur on Monday night and Spurs winger Lucas Moura has warned the Red Devils that the Lilywhites have a number of options apart from goalscorer Trippier. 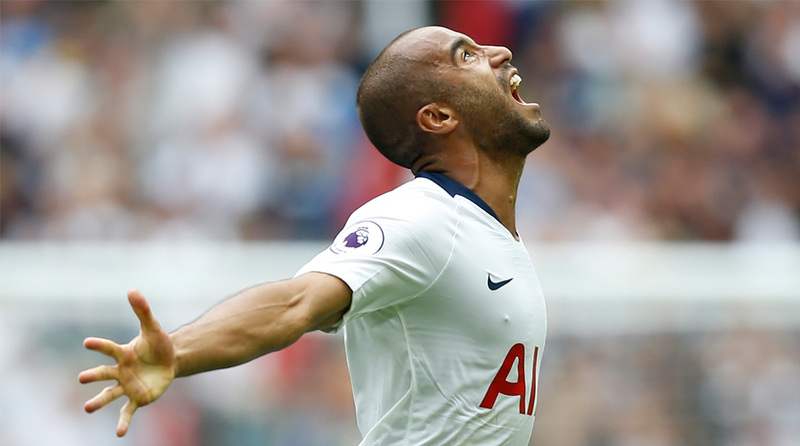 Moura netted a golazo to open the scoring in the North Londoners’ 3-1 win over Fulham, but it was Trippier’s second-half free-kick that dominated headlines. The fullback’s cracking effort will definitely be in the running for Goal of the Month, such was the sheer quality of the effort from the English defender. Danish midfielder Christian Eriksen and Moura are the other viable options incase Trippier isn’t on the pitch or doesn’t elect to take a free-kick. It was a special day for the Brazilian winger as he notched his maiden Premier League goal and the former PSG man admitted at being over the moon. Spurs are among the few teams to boast a 100 per cent record after two games played in the Premier League but their next trip is a daunting one, indeed . For while United have struggled to click under Jose Mourinho this season, they will be akin to a wounded beast when the sides clash at Old Trafford on Monday night. They have an impressive home record under the Portuguese tactician and with several of their first-team regulars set to be restored to the lineup, will definitely churn out a better performance than they did against Brighton.